When used regularly, these herbs have been shown to reduce the occurrence and severity of hot-flashes and other symptoms associated with the hormonal fluctuations. Hot Flash Relief benefits for both Men & Women. 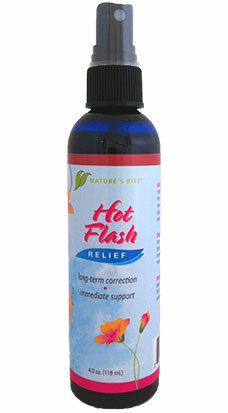 The Hot Flash Relief™ spray is a water decoction of numerous herbs that have been used by centuries to balance the hormones of women undergoing menopause. When used regularly, these herbs have been shown to reduce the occurrence and severity of hot flashes and other symptoms associated with the hormonal fluctuations. Black Cohosh and Sage were used extensively for this purpose by the native Americans. Mexican Wild Yam has natural estrogen mimicking components that have been relied on by women of the southwest regions of America for years. Chaste tree berries are the natural solution of choice for many women in the east to balance hormones. In parts of the Mediterranean and Africa, they are used to ease pre-menstrual stress. Lavender, St. John’s Wort are both very valuable in calming and relieving excess nervous activity that can be associated with these feminine “power surges”. Combining all of these herbs into one simple spray allows you to balance your hormones, relieve hot flashes and over-time, to reduce the occurrence of menopausal symptoms. How does this help women? The “The Change” can be a troubling time in every woman’s life, where the changes in the body are highlighted by physical discomfort and mental stress issues. During this time women often experience a range of emotional swings, as well as hot flashes, night sweats and sleep disturbances that make coping with life uncomfortable. Although Hormone Replacement Therapy (HRT) was once a popular option for dealing with the changes that the body experiences, it is not without risks. However, there are natural alternatives, which can balance the hormones. One of these is a supplement derived from the black cohosh plant. Black Cohosh is a member of the buttercup family and is native to the United States. It was first used by Native Americans, who harvested the root to treat menstrual cramps, hot flashes, and stomach upsets. Today, the dried root is still one of the most popular choices for women looking to treat their menopause symptoms naturally!